Bernd Wiesberger of Austria sealed a dramatic win at the Indonesian Masters with a five-under-par 67 to defeat a persistent Ernie Els of South Africa by one shot on Sunday. 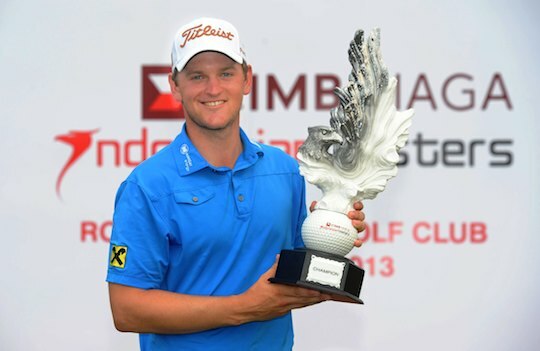 Wiesberger, 27, won his second title in Asia and completed the four rounds at 15-under par 273 at the Royale Jakarta Golf Club. Els, the reigning Open Champion, settled for second place after carding 68 while overnight leader, Daisuke Kataoka of Japan, battled the nerves of leading a tournament for the first time in his career to claim third place on 275. Wiesberger, whose coach is based in Indonesia, credited his iron play for his victory and dedicated the win to his grandfather, who passed away a year ago. “I was struggling in the beginning after my birdie on one. But at the turn, I got a bit of momentum going because I was confident with my ball striking,” he said. Wiesberger made the turn in 34 but tightened his grip on the lead with an eagle three on the 12th hole. However, playing partner Els eagled the same hole to keep pace with Wiesberger after making a slow start to his final round. In the end, the holes ran out for Els but he was far from displeased with his efforts after a closing birdie lifted him into outright second. “I played and fought hard. I wasn’t quite at my best but had a good time,” said Els. Tasmanian Ryan McCarthy enjoyed his best finish in a major event since turning pro at the end of 2012, shooting four rounds of 70 to tie for 5th at 8-under, with Unho Park and Jake Higginbottom a further stroke back.